Well, all plants die eventually, but annuals die so quickly! At least some of them do. Evening-scented stock, after the pull. Not all that pretty, but strangely sculptural. If I were a mixed-media artist, I might grow them just for the dead stems. And when you pull the dead annuals from the garden, you leave behind unsightly bare patches. 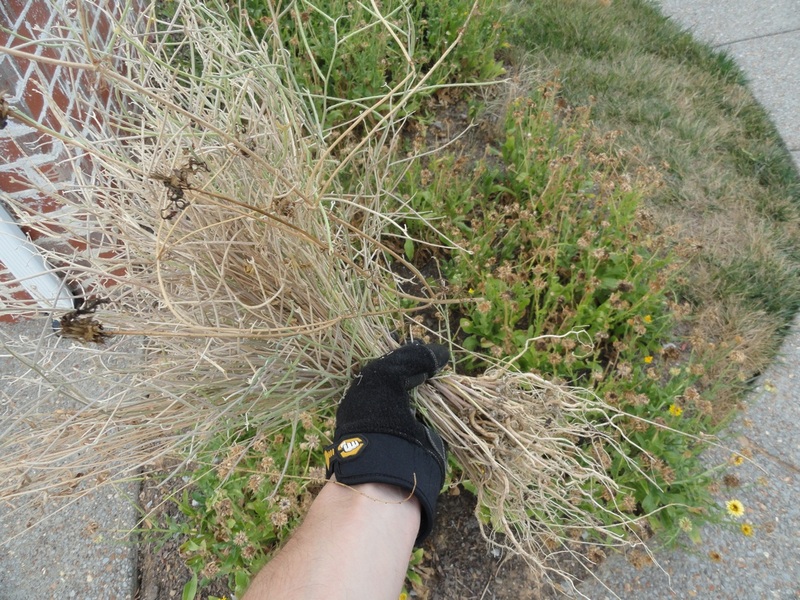 But they don't stay bare for long because weeds are happy to populate them. So...how do you deal with this problem? Do you swear off annuals altogether? Or is that too extreme? Do you wait until your first batch of annuals (the evening scented stock, the cosmos) looks tattered and worn, then pull and replace with new bedding plants purchased at a nursery? Personally, I have to say that after (a) sowing numerous different kinds of annual seeds, (b) getting zero germination on some of those, (c) spending time on my knees thinning out seedlings from the ones that sprouted too prolifically and (d) watching some of the survivors like this stock race through a bloom period and then toward an early demise, I'm ready to cut way back on sowing annuals next year. But I can't quit them completely. Not when I see how much the birds and the bees and the butterflies enjoy months and months of cosmos and zinnia flowers. How about you? Where do you come down on the annual/perennial divide? If you do sow annuals, how do you deal with the inevitable bare patches? Do you mulch when the annuals die, then clear the mulch to sow next year? And if you do still love annuals, despite their drawbacks, which are your favorites and why? Comments -- and links to photos of annuals in your garden, either in bloom or in senescence -- are greatly appreciated! PPPS - The title of this post pays homage to the 1992 song "The Trouble With Andre" by Brit Pop due Shakespears Sister. A friend of mine put it on a mix-tape for me in high school. Yes, a mix-tape. From back when there were tape recorders, around the same time as the dinosaurs. Anyway, I never had any idea what the song was actually about, but it sure is a catchy tune. Aaron, I used to be a perennial snob, but gave up on that after a bit more research & experience! Watching goldfinches wrench the sunflower seeds out of my sunflowers is so much fun I'll never NOT plant them again! And marigolds ( http://bit.ly/PQrt3I ) are such an asset to both vegetable gardeners and butterflies, I can't avoid those, either! Not sure how this plays out in your climate, but I find some annuals get by with much less coddling. Fortunately, these are often my favorites - zinnias, cleome, cosmos. And with cleome, once you plant some they sow themselves in perpetuity! Some people think that's a problem, of course. As for other annuals, I only grow them in containers where I can water with relative ease. In any case, you shouldn't draw too much in the way of conclusions from performance in a really hot, dry year like this one. 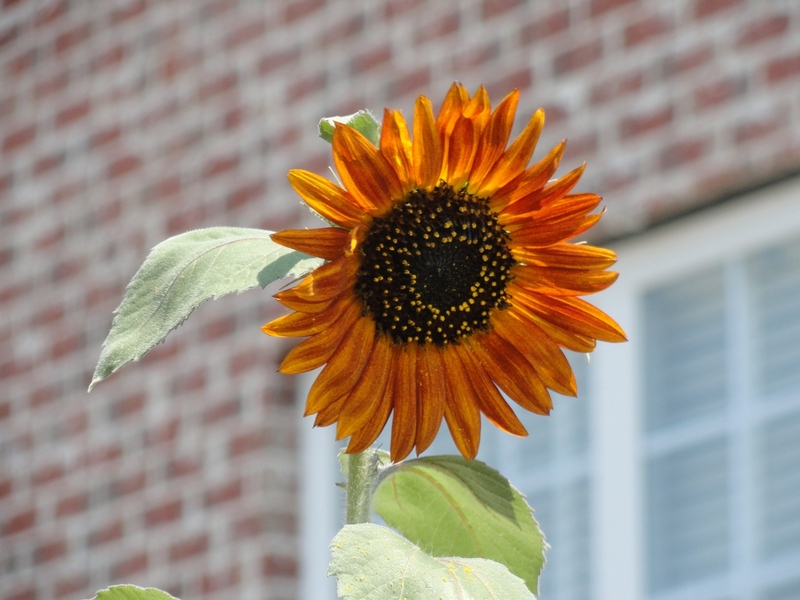 Finally, if you like sunflowers, have you looked at perennials sunflowers? Helianthus occidentalus (western sunflower), and H. molis (downy sunflower) are great, I grow them both. Not as colorful as some annual selections, but tough! Thanks for the suggestions, Jason. Can't say I'm all that familiar with cleome. But checking out the photos on Daves Garden (http://davesgarden.com/guides/pf/showimage/1699/) I think I may have seen some blooming on a roadside today. I'll check it out. As for zinnia and cosmos, they're *usually* relatively trouble-free in my garden, but the drought this year played havoc with both of them. With cooler temps and some rain this past week, they've both perked up remarkably well, especially the zinnias. 1) How prolifically do Helianthus occidentalus and H. molis reseed? And is it easy to pull up any seedlings that show up in an unwanted spot? 2) In your experience, do the perennial sunflowers attract a lot bees, butterflies and/or birds? 3) Do you think they'd survive if I planted them mid-summer? Per the topic of this post, I've got some open spaces where some annuals have burned out earlier than I expected. I kinda gave up on traditional annuals this year, except for sunflowers, I too will always try to have sunflowers. I just felt that regular annuals required too much coddling and didn't offer me much in return. I used to grow them in pots on our deck, but now I grow herbs in those pots. Yes, they're mostly annuals too, but I feel like they're more bang for the buck. They're decorative, edible, and most are pollinator magnets. I grow basil, catnip, parsley (biennial), dill, fennel, lemon balm (great in cocktails), chives (perennial), and lemon verbena. I don't have any experience growing Stock/Matthiola. Sorry. BTW, love the mix-tape reference. I discovered some of my favorite bands (Pixies, Breeders) thanks to mix-tapes my older brother made for me. I grew up on obscure late 80's/early 90's music. Thanks Julie. I've got lemon verbena on my list of plants to try down the road! I like annuals but have to stop growing so many as the perennials take over too fast. Though to be fair to annuals, many perennials die back or go dormant and leave bare spots. The trick is how to plant to prevent this. Right now there are many bare spots in my garden from perennials but I am working on the issue. Next week is the Perennial Plant Society of Middle Tennessee. This Tuesday at 6:30 for refreshments and 7 pm for the program. We have a speaker all the way from Rainbow Iris Farms in Iowa. He has won awards for his presentations. Please do come if you are able to make it as it promises to be a well attended and good program! I seem to remember you were going to try to come. PS. Yes on the bluestar, aka threadleaf amsonia. I am not a big fan of the other and prefer only hubrichtii types in my designs. Everyone who sees it loves it too. Very drought tolerant as well. And yes, I do plan to attend the PPSMT meeting and sign up for membership. Hopefully I can meet you there in person! On your recommendation, I've added the bluestar to my list of future plants to try. Any particular advice on how to grow it and have it thrive? Hey at this point even some of my perennials are toast. Hoping I get some of that rain this weekend but an inch of rain won't help a whole lot with what is going on here. Sorry you've lost so much too. Hey Sunray, Actually a lot of perennials - and some of the annuals like zinnia and pineapple sage - actually bounced back with the couple inches of rain that has fallen here over the past week. Hopefully you'll get enough rain soon to make a difference too! Here's the deal with annuals: they're all as different as perennials in their cultural needs. Stock are a cool season annual. If you lived in zone 4, they'd grow all summer. But in your zone 8, it's just too hot so they go to seed and die, kind of like pansies. It's biologically controlled. They're not genetically engineered to live through a hot summer. However, sunflowers, cosmos, and zinnia can take a lot of heat. So can gomphrena, vinca (periwinkles), lantana, evoluvus (Blue Daze), verbena, herbs, petunias, etc. The only annuals I recommend sowing are zinnia, cosmos, and sunflowers. Buy the rest in cheap 6 packs. Annuals also like loose soil, such as potting soil and have high fertilizer needs. They've been bred to live in pots so you may have better germination success if you sow them in pots, which will give them warm, loose soil, and then transplant them as plugs into the garden. Zinnia, cosmos, and sunflowers should germinate easily in average garden soil. Just because a garden center sells seeds for a ton of annuals, doesn't mean they'll all grow well here. It's a marketing decision not a horticultural one. Thanks Casa. I realize I made a mistake with the stock. I'm sure I'd probably like it better (though I'd still be miffed that it wasn't fragrant) if I lived up North. As you say, I plan to stick to zinnia, cosmos and sunflowers. Zinnias and herbs are the only annuals I grow annually, but not from seed; I buy them in progress. Usually, by spring I'm ready to give the boot to a few houseplants that need reviving, so I plant them in my garden, growing them until they get sacrificed to the ice gods. Thanks for the comment, Lee May. Any reason you don't grow zinnias from seed? I find they're pretty easy to get started. But maybe you prefer being able to place seedlings right where you want them?